On September 2, 1945, Australian war reporter Wilfred Burchett left Tokyo by train, intent on reaching distant Hiroshima before any of his journalistic colleagues, who were banned from taking such a trip by the American occupation chief, Gen. Douglas MacArthur. Burchett, who had written dispatches glorifying the firebombing of Japanese cities, was just looking for a scoop. The following morning he encountered what he would describe as a “death-stricken alien planet.” He noticed a dank, sulfurous smell as he was taken directly to one of the few hospitals left standing. Its director felt certain that radiation sickness, far from being merely “propaganda” or a "hoax" as the United States was claiming, was very real. One in five patients was developing purple skin bruises, white cell counts had plunged for many, some were also losing their hair or simply expiring without any known injuries. This part of the story is, by now, pretty well known. What happened next is not: the real beginning of the decades of suppression I detail in my new book and ebook, Atomic Cover-Up. They were not happy to find Burchett already there and with a finished article. He asked them to carry the story back to Tokyo and transmit it to his paper. They refused. 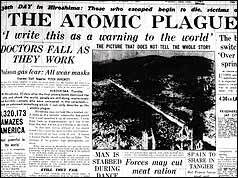 Burchett managed to transmit his story to a colleague in Tokyo, who sneaked it past the censors, and it ran on September 5 on the front page of the London Daily Express, under the headline the atomic plague. Articles written by the American reporters who had landed in Hiroshima gave no evidence that they had visited the hospitals. Yet Lawrence, years later in his memoirs, revealed, “We talked with dying Japanese in the hospitals.” Were those stories censored by MacArthur’s people? Lawrence also disclosed that MacArthur was “hopping mad” about the press junket and cut off supplies of gasoline to planes that might make another journo trip possible. Then he ordered all American reporters out of Tokyo to a closely watched enclave in Yokohama. Meanwhile, the first American reporter to reach Nagasaki, George Weller, had found a similar “plague” in that city, but made the mistake of filing his stories directly through MacArthur’s office. All of the pieces would be spiked, only appearing for the first time in 2005. When the briefing broke up, Burchett was taken to a hospital, where it was discovered that his white blood cell count was below normal. Then, on leaving the hospital a few days later, he discovered that his camera containing film shot in Hiroshima was missing—and that MacArthur had ordered him expelled from Japan. For much more on censorship and suppression of words and images--and key film footage shot by our own military--in the decades that followed, see my book Atomic Cover-Up. And my e-book on how the first Hollywood epic, from MGM, on the bomb was censored--including by President Truman himself.